The Falcon's Brother (RKO, 1942). One Sheet (27" X 41"). Mystery. Starring George Sanders, Tom Conway, Jane Randolph, Don Barclay, Cliff Clark, and Edward Gargan. Directed by Stanley Logan. 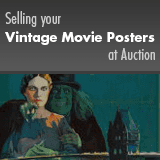 A Heritage first, this unrestored poster has good color and an overall presentable appearance. It may have edge and fold wear, fold separations, creases, tears, pinholes, smudges, stains, misfolds, some surface rippling, chips in the borders and folds, and may show signs of light toning. Paper and cellophane tape on the verso. Please see full-color, enlargeable image below for more details. Folded, Fine.